An Earth day can be measured in different ways. Measure the time it takes for a complete rotation of Earth around its axis. Measure the time it takes for the Sun to appear in the same meridian in the sky. This interval is known as the solar day. Measure the time it takes for a distant star to appear in the same meridian in the sky. 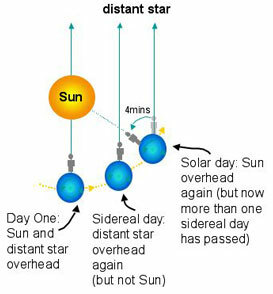 This interval is known as the sidereal day. The time interval mentioned in (1) is equal to the sidereal day. Why? Because we measure the angular rotation speed by using distant stars as references. These reference points are very distant astronomical objects called quasars. Sidereal day is also 23 hours, 56 minutes and 4.1 seconds by definition. Remember, Earth rotates around its axis eastward (counter-clockwise as seen from above the North Pole) and moves around the Sun at the same time. Earth moves around the Sun counter-clockwise as seen from above the Plane of the Ecliptic. The plane on which all planets of the Solar System revolve around the Sun (Pluto was an exception but it is no longer considered a planet) is known as the Plane of the Ecliptic. Earth moves a little less than a degree around the Sun during the time it takes for 1 full axial rotation. So, for the Sun to appear on the same meridian in the sky again after 1 full axial rotation, the Earth has to rotate one extra degree to bring the Sun into the same apparent meridian in the sky. 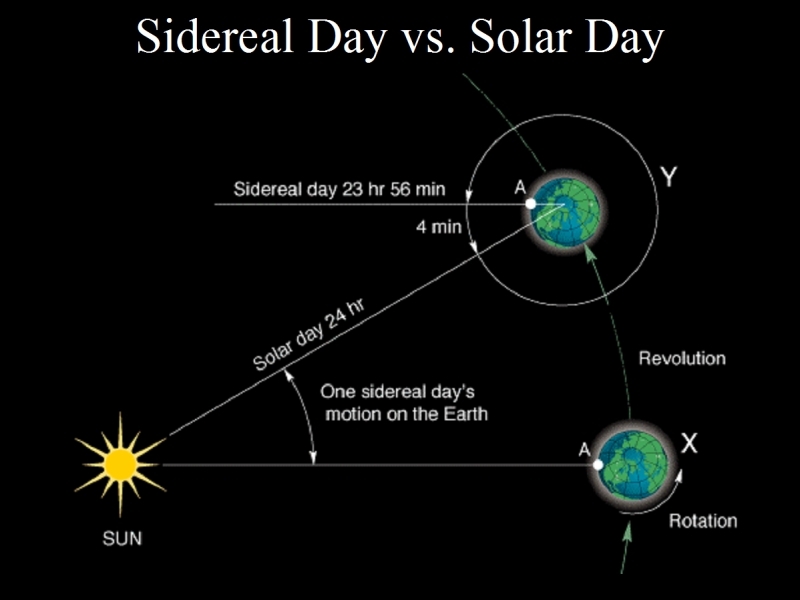 This is why the solar day is longer than the sidereal day by about 4 minutes. The length of a solar day varies throughout the year. The accumulated effect of these variations produces seasonal deviations of up to 16 minutes. The average solar day is defined as 24 hours long but this average is not exactly 24 hours as measured by atomic clocks so adjustments – leap second – are made to UTC. The seasonal variations of the length of a solar day are caused by the fact that Earth’s orbit around the Sun is not a perfect circle. There is a complication due to the axial tilt of Earth’s axis as well. Earth’s orbit is an ellipse so the Earth moves faster on its orbit around the Sun when it is nearest the Sun (perihelion) and slower when it is farthest from the Sun (aphelion). This causes the time difference between the solar and sidereal days to change. Currently it takes 23 hours, 56 minutes and 4.1 seconds for 1 full rotation of Earth around its axis. The rotational speed is decreasing due to the moon’s gravitational pull. The Earth is spinning a little slower every year. Scientists measure Earth’s axial rotation speed using a technique called Very Long Baseline Interferometry (VLBI). VLBI measurements are made daily by an international network of stations that team up to conduct observations at the same time and correlate the results. NASA Goddard research center provides essential coordination of these measurements, as well as processing and archiving the data collected. And NASA is helping to lead the development of the next generation of VLBI system through the agency’s Space Geodesy Project, led by Goddard. Earth’s axial rotation is slowing down because of tidal forces (gravitational pull) between Earth and the moon. Every 100 years, the sidereal day gets about 1.4 milliseconds, or 1.4 thousandths of a second, longer. Since 1967, the definition of a second is based on an extremely predictable measurement made of electromagnetic transitions in atoms of cesium. These “atomic clocks” based on cesium are accurate to one second in 1,400,000 years. The second is the duration of 9 192 631 770 periods of the radiation corresponding to the transition between the two hyperfine levels of the ground state of the cesium 133 atom. This entry was posted in geophysics, science, society and tagged axial tilt, Earth, ecliptic, planets, sidereal day, solar day. Bookmark the permalink.